I love my Bible. Every time I pick it up, there is perfect wisdom waiting to fill my soul. No matter how many times I read it, it is new every morning, lifting my spirit and narrowing my focus on the will of my Father. My Bible is worn with years of use and smudged with tears of joy and sorrow and frustration. Recently, I was making my through Luke. 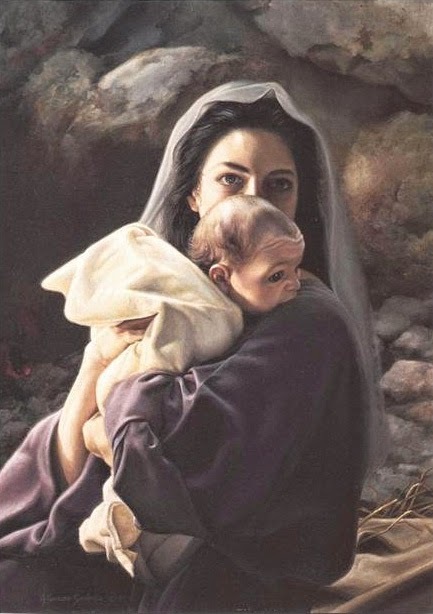 As I read the account of Mary, I realized that Mary's story was not only the story of the young woman chosen to be the mother of our Savior, but it was my story as well. You see, both Mary and I were filled with the Holy Spirit. We were both chosen to carry our Savior - she in her womb and I in my heart. We were both highly favored and blessed among women. Mary and I, when we encountered the God of universe answered "Be it unto me according to thy word". And if you are a follower of "The Way", then Mary's story is your story as well. You, too, were called from among the people. You were filled with the Holy Spirit. You, in essence, became the "handmaid" of the Lord. Think of it - Mary was just like you and I. She was nothing special. She was not from a wealthy family. She was not highly educated. We don't know if she was physically beautiful, but if she was, it was never mentioned. She was just an ordinary girl. Yet she was chosen to bear the Savior of the world. And, you - you ordinary, imperfect, undeserving human being, were also chosen. You were chosen to be filled with the Holy Spirit and to bear the Savior to the lost. You were chosen to be the Lord's handmaiden (or servant, if you prefer) and, in perfect faith say "Be it unto me according to thy Word". Today, remember who you are. You, dear ones, are chosen among the people. Thanks! I love this! I never thought of it this way. The Lord has blessed you with deep insight into spiritual matters. I had never considered this before and it gives a new meaning to our work of witnessing for the Lord. Thank you for sharing. And so often we don't even know it, or appreciate it. His goodness can come to us in the form of a struggle, the result of which will meet our needs and bring Him glory. Those are the ones I love best. When we are on a winding road, not knowing what is ahead, and He has it all mapped out to fill our hearts...hopefully with praises !!! You are a Saint on earth!.... Bless YOU! bear the savior and she said yes. Yes there are and yes she was. I have them on my book shelf now. Yes there are lost books and yes she was asked. I have them on my bookshelf now. The catholic church decided it had the right to decide what books were out of the Bible and what books were in. The book of revelations was nearly cut out. The Christian church, as an earthly organization, recognized the Word of God (John 10:27). It didn't give us the Word of God. Also, it was the Jews who gave us the Old Testament. The authenticity of the New Testament documents rests in the inspiration of God through the apostles, not the roman church. Furthermore, the roman church did not give us the Old Testament. The Jews did. How can you claim the roman church gave us the Bible when it did not give us the Old Testament? Finally, when the roman church claims that it is the source of the sacred Scriptures, it is, in effect, placing itself above the word of God by claiming that through it's authority we received the word of God. You best stay away from the "lost books" they are not inspired and will lead you away from the truth which is contained in the Bible ALONE. What are the names of your "lost books"? Was the new testament even written when 2 Timothy 3:16 was talking about all scripture was inspired. He was probably referring to the old testament. "The catholic church decided it had the right to decide"
Thank you soooo much for this insight. It truly speaks to my heart. God bless.